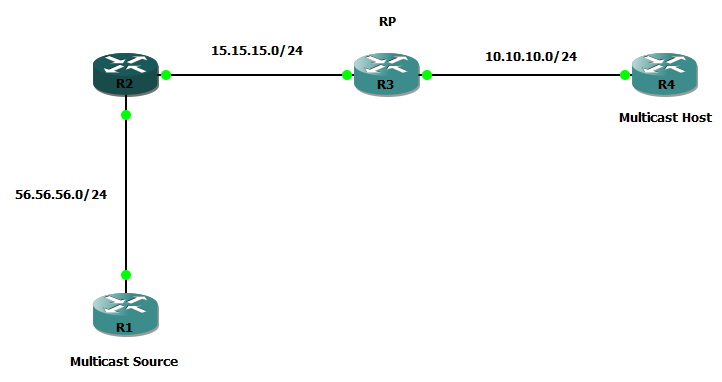 This lab is setup for static Rendezvous Point, you may use this in a small environment with only one or two multicast sources, static RP is managed by manually configuring each router with “ip pim rp-address x.x.x.x”. As you can probably tell manually updating each router with a new RP could be time conusming on larger networks, so we will cover other ways to assign or elect the RP in my future blogs. Attached are the config’s for each router (Router Configs). As I’m using GNS3 I had to enter commands “no ip route-cache” and “no ip mroute-cache” on each PIM interface. Also add “no ip cef”. You won’t need this for physical routers. Now lets confirm our configurations with some well known commands. From R4 we need to confirm the IGMP memberships “show ip igmp groups” will show all the IGMP joins the router has recieved from hosts wanting to join the multicast stream. Next we confirm the RP with the command ” show ip pim rp” lets do this from R2, this will show us all RP’s and the multicast group address they are responsible for. Next from R1 we initate some traffic using “ping 239.4.4.4” you should get a reply, now we can run the command from R2 “show ip mroute summary”. This will show us the shared tree and source tree for the multicast source. This confirms our multicast setup is working correctly.